← Tom McFadden on the news – BooYah! Two new books are going into the school library, and both are well worth the extra-credit reading time. In their own different ways, they investigate the history of experimental Biology, looking at the contributions of individuals and groups and some of the surprising discoveries made over the last century. 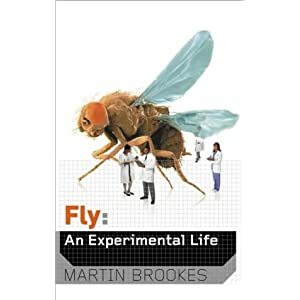 “Fly: An Experimental Life” by Martin Brookes, does not at first glance look like the kind of book you’d want to pick up and read. However, it is a well-written, funny and IB-relevant text that looks at some of the characters of the fruit fly world and the great contributions this tiny species has made to scientific understanding. These contributions include gene mapping, experimental genetics and evolutionary biology, as well as studies of gene interactions and relationships, learning and sexual warfare. Thousands of scientific papers have been published based on fruit fly research, and through reading this book, you will get a real appreciation for how Biology works, how paradigms and attitudes have shifted over the last hundred years and how the dedication of the few has led to advances for us all. “It has always been convenient, if sometimes simplistic, to divide biologists into two distinct camps, namely the experimentalists, as exemplified by Morgan, and the natural historians, as exemplified by Darwin. The legacy of this divide can still be seen today. Modern biologists, like belly-buttons, tend to fall into one of two categories, ‘innies’ or ‘outies’. ‘Innies’, the modern descendants of the experimental tradition, spend their entire lives working indoors. They are most comfortable sitting at the computer or laboratory bench and develop acute migraines when exposed to direct sunlight. To this group belong the biochemist, molecular biologists, geneticists and mathematical modellers. Most of these people will not own a pair of binoculars. In contrast, ‘outies’, the modern-day naturalists, are laboratory illiterate. They understand how to open the fridge door but that’s about as far as their indoor knowledge extends. None of this matters to an outie, of course. Outies are more interested in devoting all their energy to prodigious beard growth and memorizing the Latin names of a thousand different bird species. All outies own a pair of extremely expensive binoculars, which are worn at all times, with the maker’s name facing outwards. To this category belong the ecologists and, well, that’s about it. Next up is “The Immortal Life of Henrietta Lacks” by Rebecca Skloot. 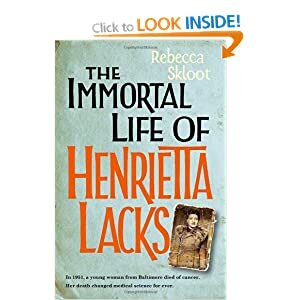 A decade in the making and almost a sure-thing to top many science book of the year lists, Skloot digs up the murky history of HeLa cells, the discoveries that have arisen from research based on them and the lasting effects this work has had on her family. This book is incredibly well-crafted, balancing science and emotion in a moving tale. Skloot jumps between the near-present and the 1940’s-50’s, writing about the discovery of the world’s first immortal cell line, taken from a biopsy of an aggressive cervical tumour of Henrietta Lacks, the descendant of a tobacco-farming slave family. As the cells grow and the biotechnology industry is built on discoveries yielded by research on them, Henrietta’s family lives in near-poverty. Skloot has written this book in such a way as to give credence to the genius, creativity and good intentions of post-war researchers, while considering the human benefits and costs of this kind of scientific discovery. Encouragingly, it is to be made into a HBO film project, which should get the story out to many more people – especially with Oprah behind it! Update: Amazon editors have announced that The Immortal Life of Henrietta Lacks is the best book in their top 100 – of all categories – for 2010. Wow. Posted on October 4, 2010, in Uncategorized and tagged bio book club, extra credit, reading, research. Bookmark the permalink. Leave a comment.